The artist who designed Mike Tyson’s famous face tattoo wasn’t the only IP holder to sue over the Hangover Party II. Luxury retailer Louis Vuitton filed a trademark infringement action, claiming that the film featured a knockoff version of one of its designer bags. Louis Vuitton’s complaint was filed in the Southern District of New York on December 22, after Warner Brothers allegedly failed to respond to a cease-and-desist letter from Louis Vuitton. The complaint focuses on an opening scene in the film, in which the main characters are in an airport. Zach Galifianakis’ character (“Alan”) sits down on a bench, places his bag on an empty seat next to him, and warns one of the other characters, “[c]areful that is . . . that is a Louis Vuitton.” According to the complaint, Alan’s bag is not a genuine Louis Vuitton bag. Rather, alleges Louis Vuitton, it is a counterfeit bag made by the so-called Diophy group of companies. The Diophy group of companies are subjects of an ITC investigation in which Louis Vuitton is seeking a general exclusion order preventing the importation of counterfeit products that infringe the decades-old Louis Vuitton marks. Louis Vuitton’s complaint against Warner Brothers alleges that “it is custom and practice in the film industry that, when branded products are to be used in a movie, a motion picture studio requests and the brand owner provides express consent with respect to the use of its branded products in a movie. Moviegoers and consumers who purchase and/or view recorded versions of the movie thus are likely to presume that branded products shown in a movie are authentic.” The complaint further claims that “[b]y using the infringing Diophy Bag and affirmatively misrepresenting that it is a Louis Vuitton bag, the public is likely to be confused into believing that the Diophy Bag is an authentic Louis Vuitton product.” The complaint asserts causes of action for false designation of origin, unfair competition, and trademark dilution, and seeks monetary damages as well as a permanent injunction preventing distribution of any version of the film that contains scenes with the allegedly-infringing bag. The irony created by “Alan’s” concern over an imposter bag makes the scene even funnier than if his bag were genuine. That said, assuming the allegations in the complaint are true, Louis Vuitton has a right to not be impressed by this irony. I heard on the radio recently that Nello Ferrara, the creator of Lemonheads and Atomic Fire Balls candy, died earlier this year at the age of 93. The mention of Lemonheads brought back childhood memories of my sisters and I riding our bikes to the local convenience store to buy Ferrara’s candy, which came in little boxes and – if I remember right – put us back a whopping 10 cents per box. The news of Mr. Ferrara’s passing and the sudden surge of childhood memories encouraged me to do a little research on Ferrara’s company. According to the New York Times, the Illinois-based Ferrara Pan company was started in 1908, and Nello took it over from his father decades ago. Nello’s son, Salvatore Ferrara, is the company’s current president and CEO. Salvatore claims that his head was shaped like a lemon when he was born, inspiring his father to invent the Lemonhead candy. The full New York Times article can be found here. Regardless of the inspiration, a quick search reveals that the Ferrara Pan company has a track record of protecting the names the company has given its products over the years. The company has filed over 250 trademark applications, one of the first being filed in December of 1954 for the “ATOMIC FIRE BALL” mark. The mark for “LEMONHEAD” came in April of 1963. 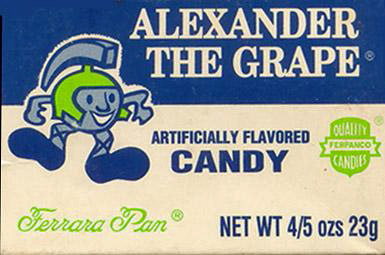 One registration that I was particularly excited to see was the November 1975 registration for “ALEXANDER THE GRAPE,” which is associated with my favorite Ferrara candy (although it appears this candy may now go by the name “GRAPEHEAD,” registration for whi ch was filed in 1996). Over the years, the company has expanded the reach of its marks beyond candy, filing applications for marks associated with everying from body lotion and lip balm, to clothing, to alcoholic beverages. Many of these marks have since been abandoned, but the company does sell clothing bearing the company’s marks on its website. It is clear, though, that candy is still the company’s main focus: it reportedly produces 135 million pounds of candy per year (using 200,000 pounds of sugar per day). Warner Brothers has met its fair share of IP-related legal battles in connection with 2011’s popular hit movie, The Hangover Part II. The first assault came before the film was even released. In April 2011, the artist who designed Mike Tyson’s famous face tattoo attempted to block release of the film, claiming that a replica of the tattoo was used in the film without the artist’s permission. In a complaint filed in the Eastern District of Missouri, Plaintiff S. Victor Whitmill claimed that character Stu Price, played by actor Ed Helms, sported a “virtually exact reproduction” of Tyson’s tattoo without Whitmill’s authorization. Whitmill alleged that “[t]he Pirated Tattoo is a recurring device and plays an important role in the plot of the Movie.” A side-by-side comparison of Tyson’s tattoo and the alleged replica is here. Whitmill sought to block release of the film with a preliminary injunction. Interestingly, Whitmill did not register the copyright for the original tattoo until April 19, 2011. In its opposition to Whitmill’s preliminary injunction motion, Warner Brothers noted that Whitmill’s registration of the Tyson tattoo came long after Tyson (and, in turn, his tattoo) had appeared in the original Hangover movie, and in the midst of the Hangover II’s marketing campaign (which included materials showing Helms’ tattoo). The case raised the novel issue of whether a tattoo is enforceable as a copyright. Warner Brothers argued that extending copyright protection to a tattoo created on a human being – with human flesh acting as the “medium of expression” required under copyright law – “would lead to troubling and unintended results under the Copyright Act.” First, Warner Brothers argued that if a tattoo was considered a copyrightable work and gained “recognized stature” under the Copyright Act, a court could enjoin the tattoo holder from ever removing it. Second, to the extent that the tattoo holder wished to alter the tattoo in any way, such alteration would be in violation of the artist’s exclusive right to prepare derivative works, and the artist could obtain a court order requiring the offending work be destroyed (i.e. the tattoo removed). Finally, any publication of the person sporting the tattoo would be in violation of the artist’s display right under the statute: the publisher would be on the hook for infringement, and the tattoo holder would be considered a contributory infringer. David Nimmer, author of the frequently-cited “Nimmer on Copyrights,” supported Warner Brothers’ argument as an expert witness, submitting a lengthy declaration in which he admits to changing his previous position on the issue. Of course tattoos can be copyrighted . . . I don’t think there is any reasonable dispute about that. They are not copyrighting Mr. Tyson’s face, or restricting Mr. Tyson’s use of his own face, as the defendant argues, or saying that someone who has a tattoo can’t remove the tattoo or change it, but the tattoo itself and the design itself can be copyrighted, and I think it’s entirely consistent with the copyright law. Having reached a settlement (the terms of which were obviously confidential), the parties filed a joint motion to dismiss the case in June. The issue of whether a tattoo is copyrightable is apparently tabled for the time being. But who knew a movie about debauchery in Thailand could spurn such an interesting debate about copyright law?